"Today’s generation of young people holds more power than any generation before it to make a positive impact on the world." The Clinton Global Initiative University - CGI U Commitments Challenge is a competition of ideas from college and university students. 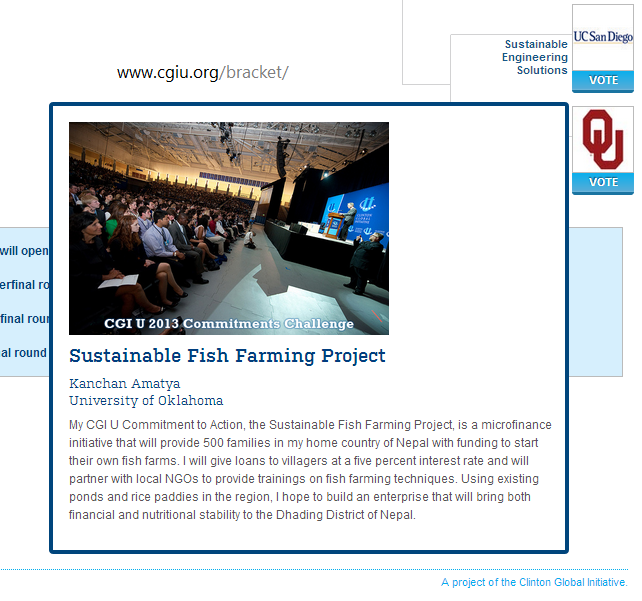 Each CGI U commitment in the bracket was chosen based on its unique and innovative approach to addressing a pressing global challenge. 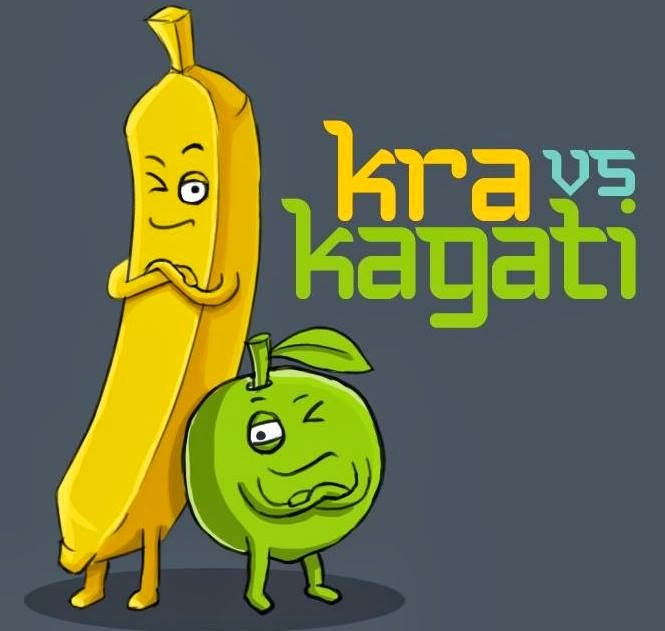 In this competition of social innovation, enterprise, and sustainability, winners advance each round based on the number of votes received. 16 University with the representatives are competing on the the four major commitment areas.
" 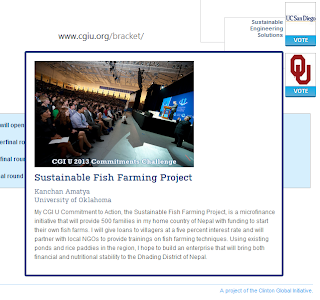 My CGI U Commitment to Action, the Sustainable Fish Farming Project, is a micro finance initiative that will provide 500 families in my home country of Nepal with funding to start their own fish farms. 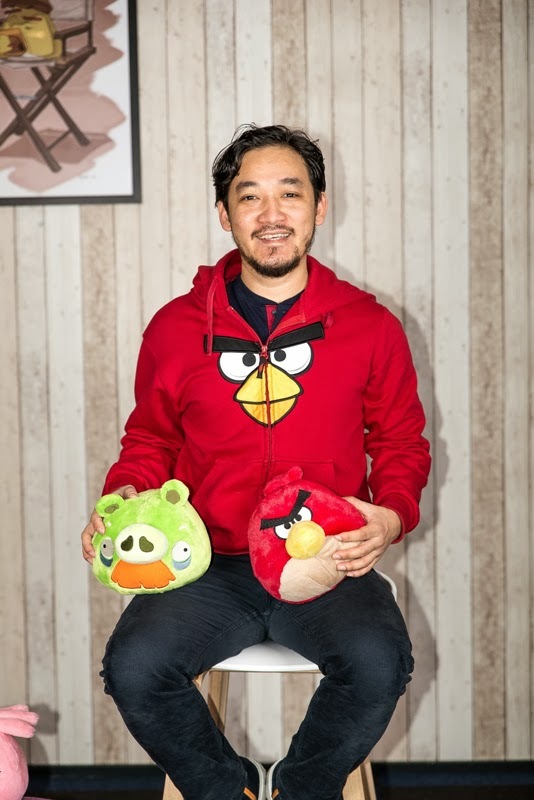 I will give loans to villagers at a five percent interest rate and will partner with local NGOs to provide training's on fish farming techniques. 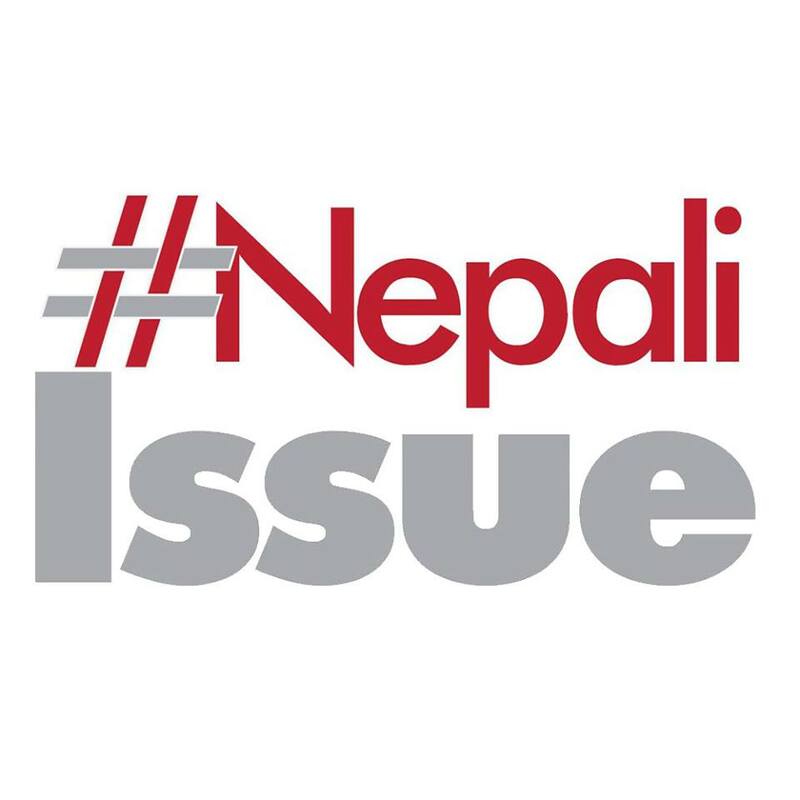 Using existing ponds and rice paddies in the region, I hope to build an enterprise that will bring both financial and nutritional stability to the Dhading District of Nepal. " 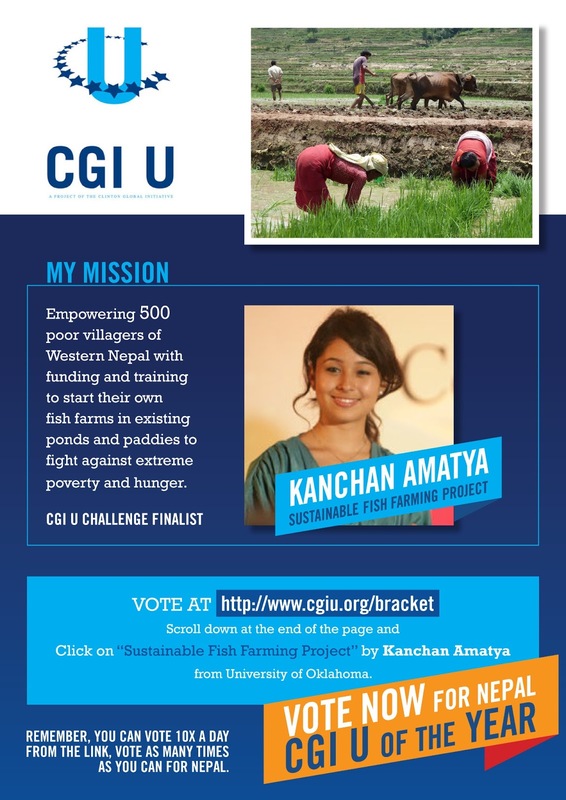 Kanchan is on her Quarter Final Round which ends on April 1-2013, Your vote will lead Kanchan Amatya to Semi Final Round for 4 Commitment Category Challengers and finally 2 from these and then one of them would be the winner. 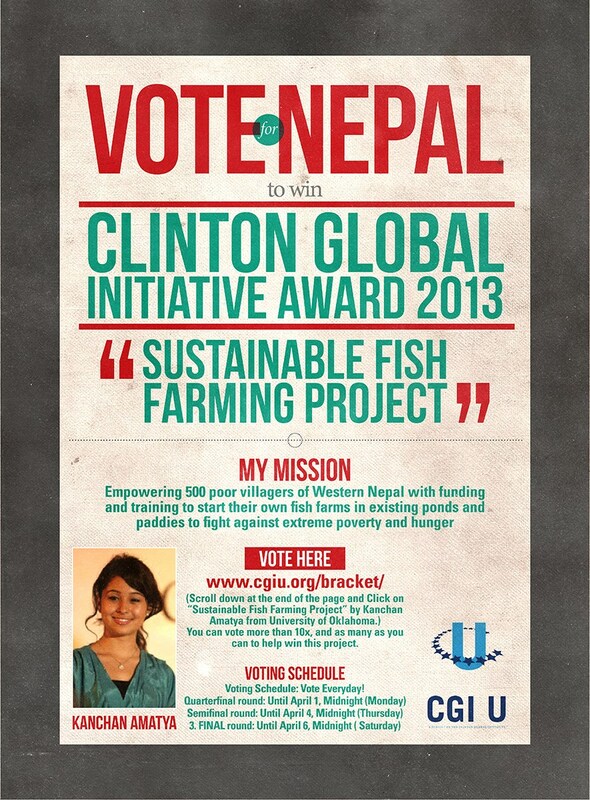 Your each VOTE will make her count reach higher and as your commitment support to her for the CGI U Commitments Challenge and finally with all your votes Kanchan Amatya with your support can make her commitment true by being announced and congratulated by President Clinton on April 6th at the Closing Plenary session of the sixth annual CGI U meeting and win the 3rd CGI U Commitments Challenge. 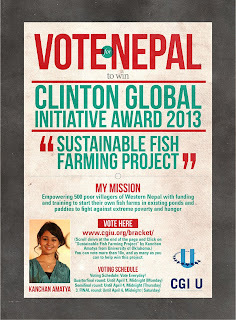 Kanchan's Project will change 500 families life and a new revolution in DHADING through Sustained Fish Farming Project.